The scene is very beautiful. Height 50 ~ 80cm. The flower buds can be some tip. The size is about 10cm flowers flared. Its features even a little romantic. From being seen clumps of day lily in early August from early May. Depending places and also altitude. It is possible to see in the plateau of Japan. Flower day bloom morning , it ‘s wither in the evening. However , flowers are beginning to bloom in sequence from the mountain. You are in the long period of time comparatively in the day. It is desirable to see in the early afternoon. Kirifuri Highlands is one of the sunlight mountain range. It is possible to see clumps of day lily Akanagisan hillside , the south slope. The grassland in , gazebo and promenade also be installed , I can enjoy the atmosphere of the open-minded nature. There is a lift in the old days , I was looking at the day lily from a high place a little. 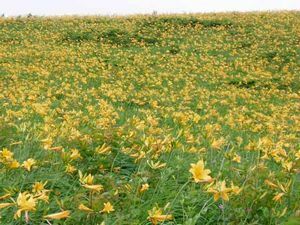 In Kirifuri Highlands , there is a need to go up to walk as far as it will bloom day lily. Let’s have a sports shoes. Nikko Kirifuri Highlands Hemerocallis flat picnic site is open in the spring of 2013. Oguninuma is caldera lake of road warriors 4 kg less than in the Fukushima Prefecture. Mid- July from late June to bloom. This swamp is designated as a national monument. Swamp kingdom from Bandai Kogen Station has become hiking trails about 2 hours and 30 minutes. I go to Kanazawa Pass in the car a long time ago. 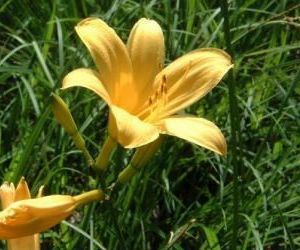 There are people that or pee or litter , time that day lily blooms are regulated now. Instead , Kanazawa Pass trying to use this bus because out. Of course, let’s enjoy hiking and observe the manners. Located in Nagano Prefecture , Kirigamine is , the foot consisting of a mountain about seven. The main mountain that make up the Kirigamine are as follows. Among them, the most high , it’s the best to go to see the day lily is car mount. It also famous as wetlands , car mount has been deposited as a layer , such as sphagnum peat acids , plants do not rot. Way to go to see the car recommendation. Proceeding a little from Suwa Chuo Expressway , a former toll road called Venus line. From here , day lily group can watch. Day lily is in bloom at the about 1680 ~ 1700m altitude , flowering state varies depending on the height. However , since the Venus line becomes free , the bloom time of day lily , there will be very congested.